Our featured video presentation is James Clerk Maxwell - A Sense of Wonder, below this you will find links to other video material. James Clerk Maxwell - A Sense of Wonder - 2015 marked the 150th anniversary of the publication of one of the greatest scientific papers of all time, in which James Clerk Maxwell described his transformative theory of electromagnetism. This video celebrates his life, his poetry, his creative genius as a mathematician and scientist and his love of Galloway, told through the journey of poet and writer Rab Wilson and featuring conversations with contemporary scientists, music, poetry and songs. Produced with support from the James Clerk Maxwell Foundation and the Dr David Summers Charitable Trust. Commissioned by Wigtown Festival Company. 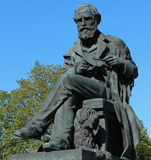 James Clerk Maxwell - What's the go o' that? A short animation from The Glasgow Science Centre. Opening passage and The White Across The Blue from: In Time of Light Two exerts from a work-in-progress by musician P J Moore. This celebrates James Clerk Maxwell’s ‘A dynamical theory of the electromagnetic field’ completed in the summer of 1864 and published in 1865. The Unification of Electricity and Magnetism Episode 8 of Professor Brian Cox’s series explains how Michael Faraday and James Clerk Maxwell showed that electricity and magnetism are two facets of the same thing. A tour round the Old Cavendish Laboratory. Professor Raymond Flood’s lecture on James Clerk Maxwell from the conference 19th Century Mathematical Physics held jointly by Gresham College and the British Society of the History of Mathematics. For audio material please see our Documentary Audio page.